This week is our third episode covering the Entente Spring offensives of 1917, and in this episode the attacks will begin. 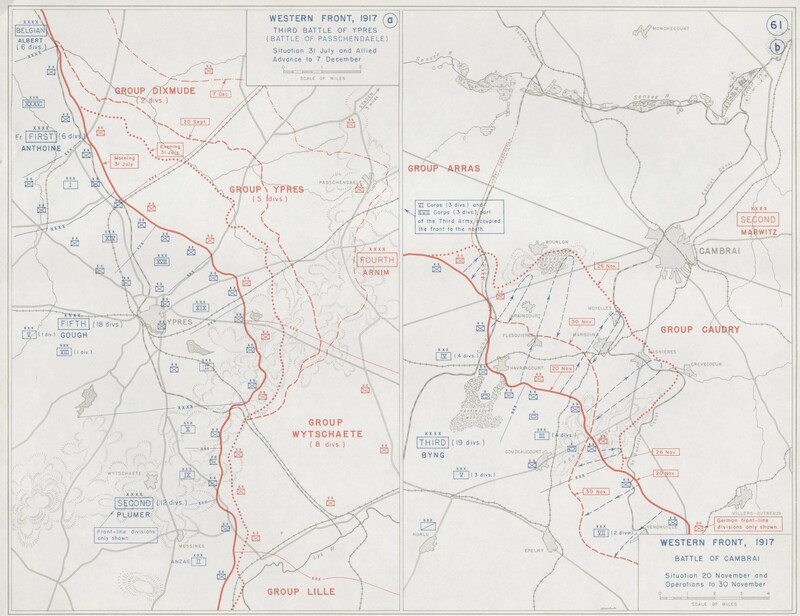 We are going to break down the attack into two areas, the first will be on the British area of the front, an area that would include the Battles of Arras and Vimy Ridge. The second part of the episode will focus on the French side of the attack, on the Chemin des Dames. Here the French army would hurl themselves against the German defenses. In this area the Germans would not be surprised at all, which they were at Arras, and their defense will be a surprise for the French. This episode will only cover the first day of the French attack, that will still give us plenty to talk about, the events after the first 24 hours of the attack will be our topic next episode. We start now, in the north where the British were putting their primary effort for early 1917 into their attacks in Arras. These attacks would take place over a stretch of the front that was 20 kilometers wide and on that front Haig would assemble three armies, the First, Third, and Fifth. This would include the Canadians at Vimy Ridge, and I should note up front here that we will not be focusing on Vimy Ridge very much today, if you want a lot more information specifically about Vimy Ridge I did a special episode strictly on that topic back in episode 114. In Arras the three British armies would be facing off against 2 British armies, the 6th and the 2nd. This put the Germans at a pretty hefty disadvantage, with the 6th Army with a total strength of 6 divisions being the target of 14 British divisions. It would have been far worse if the Germans had not brought in more troops after noticing the British buildup of men and material before the attack. One issue that the Germans would have is that these divisions were not at their top strength, with some of them still recovering from the events of late 1916. Even though they were still rebuilding it was believed that it was necessary to keep them at the front due to the demands of other areas, like on the French front to the south. While being heavily outnumbered was never ideal, at this point the Germans were almost used to it, pretty much business as usual. The British would begin their artillery preparations five days before the attack, with 2,800 guns participating. This put the concentration at a gun for every 12 yards of the front. During these opening days the guns would fire about 2.6 million shells. I know at times numbers this large are difficult to fully wrap our heads around, so in comparison, this was about a million more than the preparations for the Somme in 1916, which was the previous largest British artillery bombardment. I think the best way to determine the results of these bombardments is to look at the experiences of the recipients, the German soldiers in the trenches during the first few weeks of April 1917. Here is Oberleutenant Scheer of the 1st Battalion Field Artillery Regiment 767 "From 3rd April 1917 the [artillery] battle, which had been gaining momentum for several days, increased yet again in intensity. It was striking that on this day there was heavy bombardment by guns of all calibres throughout the rear area, special attention being devoted to approach routes, built up areas, trenches, batteries, observation posts and the depression by the railway line which housed the Hapsburg artillery command post. Only through total commitment of all ranks was it possible, sometimes by telephone, mostly by runners, to maintain links between the batteries and the Group and contact from the Group to the Regiment. During the night 8/9 April the artillery fire increased constantly in weight then, around 5.30 am, drumfire of an intensity we had never experienced on the Somme came down suddenly throughout the area from the front line to the railway. Use of the last of our signal flares brought down swift defensive fire. This had some effect on the initial assault, but could do nothing to stop the immense masses of British infantry following up." And here is Lieutenant Henigst of Baravian Mortar Company 149 "There was no longer any doubt; we were facing a serious situation. During the night 5/6 [April] the unpleasant harassing fire was suddenly accompanied by heavy enemy gas shoots, the effects of which were enhanced by an almost complete absence of wind. Very soon the entire area reaching back well beyond the gun lines was cloaked in a thick fog. Both men and animals could only move masked up, which made the supply of rations and other stores extremely difficult. During the night 8/9 April, the positions were shelled and gassed for five hours continuously, forcing the garrison to mask up and exhausting the protective potential of their gas masks. From about 3.00 am the shelling reduced in intensity then, between 3.15 and 5.00 am, ceased altogether. The reason was unclear, because fire came down with undiminished intensity on neighbouring divisions, but the pause was extremely welcome. It enabled the large number of wounded and gas poisoning cases to be evacuated, food, drink and ammunition to be brought up and collapsed dugout entrances to be cleared out." By the time that the attack would begin the artillery fire had covered the area in thick clouds of smoke and dust, including clouds of gas that the British used to suppress the German artillery. Houses and villages behind the front were heaps of rubble and the German positions were not in good shape. They had not been in the best shape even before the bombardment and now they were basically destroyed. This was mostly due to a combination of the British fire and the wet weather in the spring, causing many German trenches to completely collapse including many communication trenches, which meant any attempts to move reinforcements or supplies forward either had to be done at night or in full view in the day time. The British had also at least partially fixed their issues from 1916 and focused far more on counter-battery fire for this attack, giving the German guns a heavy beating. The infantry attack began at 5:30AM on April 9th, which just so happened to be Easter Monday. It was raining, and there was some sleet mixed in, but in general the attack would go off quite well on the first day. On Vimy Ridge the Canadians did quite well, advancing about 4 kilometers. The Third Army, commanded by General Allenby, who we will meet again later in our story during our Middle Eastern episode, advanced 3 kilometers. Other units experienced similar success. Here is a lengthy quote from The First World War by John Keegan "The first day of the battle of Arras was a British triumph. In a few hours the German front was penetrated to a depth of between one and three miles, 9,000 prisoners were taken, few casualties suffered and a way apparently cleared towards open country. The success of the Canadians was sensational. In a single bound the awful bare, broken slopes of Vimy Ridge, on which the French had bled to death in thousands in 1915, was taken, the summit gained and, down the precipitous eastern reverse slope, the whole Douai plain, crammed with German artillery and reserves, laid open to the victors’ gaze. “We could see the German gunners working their guns, then limbering up and moving back. Transport waggons were in full retreat with hundreds of fugitives from the Ridge. There appeared to be nothing at all to prevent our breaking through,” wrote a Canadian lieutenant," To summarize, after the first day things were going quite well for the British, Canadian, Australian, and New Zealand troops. On the other side of the line the situation were very different. When reading accounts of the defense one thing is very clear, after the initial attack the situation at the front was almost entirely unknown to those behind the lines. All that they could do was to continue to send troops forward and hope for the best. This was complicated by the fact that, since this was the first attack against the new German defensive tactics, the Germans did not fully understand how to utilize them. The most common mistake that was made was keeping units designated for counter attacks too far behind the front, robbing them of the ability to quickly hit back at the attackers before they solidified their positions. As the day progressed the situation became more and more desperate for the German defenders, they were simply running out of men on hand who were capable of fighting. This resulted in troops that normally would not have been defending the front lines being called upon to do so. One example of this was the Bavarian 14th Mortar Company, obviously the men of this company were not infantrymen, but those that were not deployed in the front lines when the attack began soon found themselves with little to do. Their guns, manned by other men from the company, had been captured or destroyed in the forward positions, so the commander made the decision to help the infantry in any way that his men could. Here is Lieutenant Henigst again, who was the ranking officer in the company, "In this situation those elements of the company that were located in the rear and which were to have conducted the relief had no realistic option but to make themselves available to the division as a reserve. Led by me (Oberleutnant Barth, the company commander, had been sent away on sick leave a week earlier) and strengthened with a few infantry orderlies, altogether about sixty men, were despatched to Gavrelle where Brigade [8 Bavarian Infantry Brigade – Generalmajor Karl von Reck] Headquarters was supposed to be located. The march was fraught with difficulty. Some of those who set off with us that morning must have felt that they were unlikely to live until evening." This was not even close to the only instance where any man at hand was thrown into the defense. 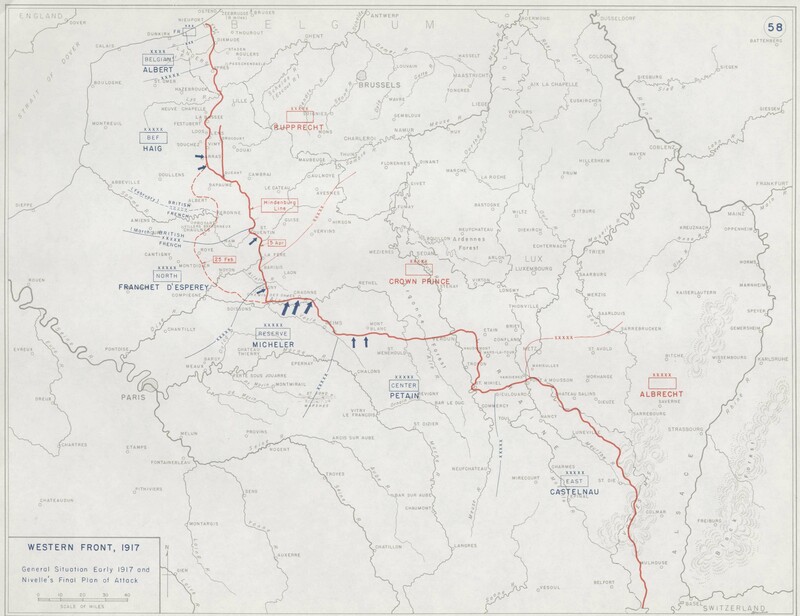 Here is a good general assessment of the situation after the first round of fighting from The German Army in the Spring Offensives 1917: Arras, Aisne, and Champagne by Jack Sheldon "These early days of fighting east of Arras represented a severe setback to the German army. Altogether on an eighteen kilometre front the British had broken in to a depth of up to six kilometres. Seven German divisions had been so worn down that they had to be relieved. Losses to date were calculated at 23,000, 16,000 of whom were missing. 233 guns, ninety eight of them large calibre, had been lost or destroyed, as had innumerable grenade launchers and machine guns, together with a mass of much needed trench stores and equipment." While the first day was quite the calamity for the Germans, they would quickly begin to recover their composure. They were assisted in this by two phenomenon which were completely out of their control. The first was that the British were now faced with the difficult job of pulling their guns and ammunition forward to continue the advance, a task that was never easy on the battlefields of the first world war. They were also assisted by the second problem that the British were having, which I am just going to let Major Graham of the 15th Scottish Division explain "The weather has, of course, been against us. Continual storms of snow, hail and rain do not make it any easier to move guns across country which has undergone a five days’ intense bombardment. Albeit, we got’em up somehow by relays with twelve to fourteen horses in [sic.] the guns and the gunners harnessed to the wagons." These delays meant that the Germans had time to rush in reinforcements, or to get the reinforcements that were present but too far away from the front to instead be right behind the lines. This meant that the continued attacks at places like the village of Bullecourt, which went on for two days on April 10th and 11th were not nearly as successful as earlier efforts. The slow down in the attack caused Haig to call a break in the attack on April 14th, to await Neville's attack on the Chemin des Dames which was scheduled to begin just a few days later. This let the artillery fully move forward and into new positions so that they were ready to support the next phase of the attack. Once the attack restarted it would continue for weeks, not being fully shut down until early June. The lengthy set of attacks were launched in support of Nivelle, but also because Haig did think that he was making real progress even if the advances on the ground were not spectacular. It would be during these weeks that most of the British casualties would be sustained. 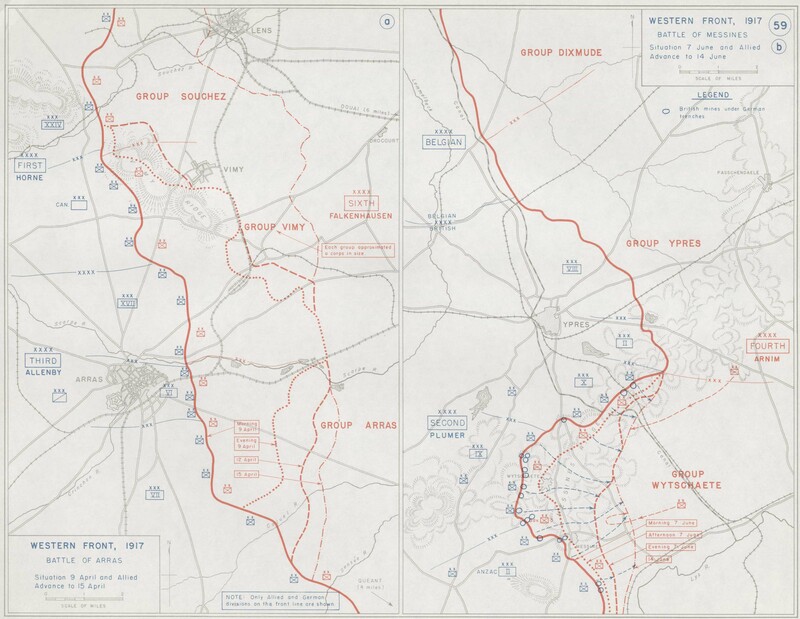 By the time that the last attacks were launched in Arras the British had already shifted their main focus to the north and into Flanders, where they were preparing for the attack at Messines and Ypres. The casualties on both sides were heavy from the British attack, with the British suffering around 150,000 casualties and the Germans between 85,000 and 120,000. These numbers were quite high, but certainly not out of the realm of normality for the Western Front during the war. For these casualties the British had gained some new positions, with Vimy Ridge being far and away the most important. The British may not have known it at the time, but the capture of Vimy Ridge would be a thorn in the side of the Germans when they were preparing for their 1918 offensives. Other territory was gained in the attack, with most areas of the front advancing between 5 and 6 kilometers. Much of this area held little strategic value, and Vimy was certainly the feather in Haig's cap, but the attacks were also thought necessary to provide assistance to the French, especially after their early disasters. These two reasons went a long way to smoothing over any concerns about the failure of the attack as a whole. On the German side their analysis of the battle identified three major issues with their opening day defenses. The first was that the troops that were sent forward to defend were simply too worn down, and there was not enough of them, but those that were present fought as hard as could be expected. The second problem was that there was not enough artillery and ammunition available to meet a determined attack. Finally, the reserves that were supposed to hit the attacks at their point of greatest weakness were too far away to take advantage of that weakness and therefore could not properly assist the hard pressed front line troops. Overall, the German defense was decent enough, and it somewhat proved the viability of the elastic defense system, especially after the first day when reserves were properly positioned along the front. 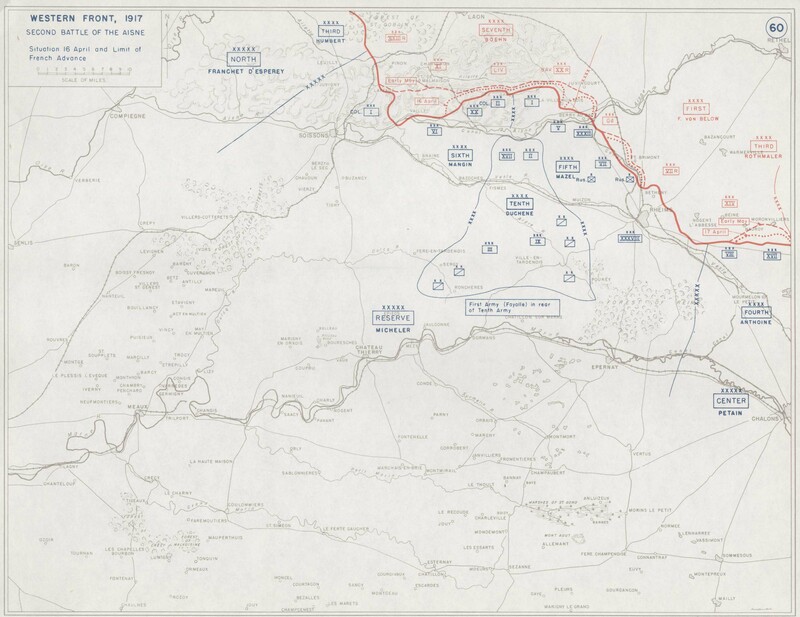 While the Battle of Arras was the primary point of effort for the British, and it would cause hundreds of thousands of casualties all told, it was just a supporting attack, it is now time to head south and to the main event, the French attack on the Chemin des Dames. We spent a good amount of time on the planning for the Chemin des Dames attacks last week, but I mostly forgot to talk about total numbers, now we have a chance to rectify that mistake. In the three armies the French were using 53 total divisions, with somewhere around 1.2 million men in total. On the German side they would have 21 divisions, so the French had a bit more than a 2 to 1 advantage. Remember, that this is actually a quite small advantage in terms of World War 1 attacks. The artillery fire would begin on April 1st, but it would not be until April 5th that the preparations would kick into high gear. Over the next three days the fire mounted until on the 9th it plateaued with almost all French guns raining fire down on the German positions and gun batteries. This would then continue for a week. Much like in previous attacks there were several instances where the French artillery would suddenly stop firing so that the Germans thought that the attack might be starting, then the French artillery would start again. The goal of these feints was to draw out the German defenders from the their hiding places so that they would be hit when the artillery fire resumed. Jules Ninet of the 89th Infantry would write of this time that "For several days now the amount of noise from the front line has been steadily increasing. The roads are full of soldiers in blue and yellow [colonial troops in khaki], all marching off in the same direction, along with whole columns of artillery, and lorries filled with ammunition and stores. We watch these huge convoys pass by, shake our heads and think, ‘Those Boches are going to cop it'"
The final few days before the attack were miserable for both sides. The weather was certainly not cooperative with freezing temperatures, heavy rain, and even some snow. This made life difficult in the trenches, with men being constantly wet and cold, these conditions were particularly hard on the French Colonial Troops who were not used to the cold temperatures. The weather went beyond just discomfort and also affected other aspects of the plan, here is General Micheler "during the preparation and the day of attack, the observation of [artillery] fire, either by aerial observers or even by ground observers, was impeded considerably by very unfavourable atmospheric conditions." All of these conditions were, of course, harder for the Germans. In the lead up to the attack one German General would give this as his order of the day on April 11th "The time has come for the decisive combat. The strengthening of the enemy fire tells of an imminent assault on our trenches. Our braves from the Rhineland, Hanover and, of course, the Guard regiments will fight dearly for their positions. I trust that not one man will give himself up." On April 15th the French officers received their final orders. In these orders they were told that the attack would begin at 6AM the next day. The men were told the exact time of the attack and they tried to get as much sleep as possible before the 3:30 wake up time the next morning. Nights before an attack were always tense, many men took time to write a last letter home, many also tried to sleep with varying degrees of success. The last order that many of them would receive came from General Nivelle which was delivered on the day of the attack and read "The hour has come! Courage and confidence! Long live France!" When the attack began at 6AM on April 16th the 6th and 5th armies would encounter somewhat uneven resistance. In many places the French troops had to cross the river, and then advance up the hillside on the other bank, before they even got to the German lines. Waiting for them was the German wire, which was still at least partially intact, and then more important German machine guns. The machine guns were spread out into shell-holes, strong points, and others were just in the exits to some of the abandoned mines the Germans were using for shelters. All of them were able to rain fire down on the advancing French troops. Even as they fired on the attacking French many Germans could not help but be awed by what they were seeing. Here is Feldwebel Wagner of the German Grenadier Guards. "To our front they came on in endless masses. Our machine guns fired as fast as they could; our rifle barrels never cooled down. Our stocks of ammunition shrank more and more and we had to resort to collecting the grenade sacks and ammunition pouches of the dead and wounded. Our stick grenades saved us repeatedly when the fighting was so close we could not use our rifles. During the afternoon the reduced lines of attackers began to dig in, seeking cover from the murderous defence we were putting up, but even though the slopes to our front were strewn with dead and wounded Frenchmen in their new blue uniforms, fresh waves of attackers arrived to swell the ranks." As the French tried to continue their advance the machine gun fire was joined by the artillery. Many of these artillery pieces had not been hit by the French counter battery fire and were well positioned to hit the French troops as they advanced. One issue was the rate that the French infantry were expected to advance. This expectation drove the movement of the creeping barrage, a critical piece of the attack plan that would suppress the German machine guns as the French advanced. However, in this case that is not what occurred and the infantry rapidly began to fall behind the artillery fire. If you remember, some of the French units were expected to advance a kilometer an hour, and as soon as they fell behind their artillery would run away from them quickly. When this problem was combined with the other German defenses, the high rate of officer casualties in the forward units, and the resulting breakdown in command and control, the offensive began to slow down before it really got going. One set of soldiers that the French had put a lot of faith in were the Colonial troops, many of which were Senegalese soldiers, although that nationality gets falsely applied to many French colonial soldiers. While much of expected out of these men, they were simply not put in a position to succeed. Here is Edward Spears, a French officer, to describe the situation "We had been taught to believe that theirs would be a headlong assault, a wild savage onrush. Instead, paralysed with cold, their chocolate faces tinged with grey, they reached the assault trenches with the utmost difficulty. Most of them were too exhausted even to eat the rations they carried, and their hands were too cold to fix bayonets. They advanced when ordered to do so, carrying their rifles under their arms like umbrellas, finding what protection they could for their frozen fingers in the folds of their cloaks. They got quite a long way before the German machine guns mowed them down." The commander of the Second Colonial Corps would describe a successful attack "The rolling barrage is unleashed almost immediately and steadily moves ahead of the first waves, which it quickly ceases to protect. A few machine guns on the plateau do not halt the . . . infantrymen, who are able to descend the northern side of the plateau to the edge of the steep slope descending into the valley of the Ailette [River]. There, they are welcomed and fixed in place by the deadly ªre of numerous machine guns that, located on the [reverse side of the] slope, outside the reach of our projectiles, have remained undamaged." The problems for the Colonial troops was much the same as in other areas, the barrage just got away from them too quickly. As the hours ticked by there were efforts to adjust fire, messages were sent by artillery officers from the forward units and the artillery was brought back to the area they were supposed to bombard 90 minutes after the attack had started, even this did not prove to be close enough and they were brought back to the 30 minute line, hours after the attack had started, and the artillery was back to the 30 minute line. The Fifth army would have greater success than the 6th but that did not mean that they found the attack to be easy, just maybe a bit less hard. When the troops of the 5th army reached the German front lines they were often forced to fight a seemingly neverending series of close range brawls, with grenades and hand to hand weapons being the primary tools. Even when the French were successful in pushing the Germans back from their front lines, which was somewhat infrequent to begin with, the elastic nature of the German defenses would then come into play. First the German machine guns would try and pin the French into place. Then the German artillery would rain fire down upon the exposed French as they tried to continue their push forward. As the Frenchmen and Colonials struggled forward the German resistance would only become stronger instead of weaker. Then the French infantry would fully lose touch with their artillery and the advance would be over. German artillery only got strong, and machine guns continued to appear in greater numbers. Just when they were completely out of strength, and they could go no further they would then be hit by German counterattacks. For many units these counter attacks could push them back, losing most of the gains they had fought so hard for, some units were pushed all the way back to their start lines. The 5th Army was also joined by the French tanks, so it is worth spending just a bit of time to discuss the performance of the vehicles during the attack. Here are part of the orders that were given to the tank forces before the attack began "Tanks and infantry remain in close association during the combat but the tanks do not wait for the infantry if they see an opportunity for going forward. Once the attack has opened, the tanks advance on their objectives and halt only when they encounter obstacles which they cannot cross with the equipment available to them. When our infantry catch up with a tank which is detained in this way, they must do everything possible to help it overcome the obstruction. If the infantry are held up by enemy resistance before the tanks are on the scene, they must lie down and wait for the tanks to intervene. The tanks will roll through them and on against the enemy, suppressing hostile fire." The tanks would set off with the infantry, but almost instantly they would begin to have problems. One of the bigger problems for the Schneider tanks was their tendency to get stuck nose down in the trenches. To prevent this issue the tanks were forced to rely on the infantry to fill in the trenches so that they could drive over them. But filling the trenches was a slow process, with some tanks waiting up to an hour for it to be completed. This just, in general, slowed down the advance, but it also made the tanks extremely vulnerable to German artillery fire. One tank officer would describe what it was like to be under artillery fire while in the tanks like this "There are some things that you’ll never forget. Sights which will be for ever engraved on your mind, despite all the horror already burned there. The tank on the left suddenly becomes an inferno. In front of it is the shell which set it alight. Two torches get out, two torches making a mad, frantic dash towards the rear, two torches which twist, which roll on the ground. A tank burns on the right; another one behind. And on our left; it looks as if someone is setting our line of steel alight like a row of floodlights." Overall, the usage of the tanks was very costly, with 52 tanks lost to enemy fire or the terrain and 28 lost after breaking down. There were a few successes, with some tanks advancing up to 5 kilometers, but these successes were too spread out and localized to have any real effect on the wider attack. While their first attempt had been a failure, the first French tank attack was still more successful than the British attack back in September 1916, so that is something. The French would learn from these failures, there will be more French armored attacks later in the war. While we, of course, know what was the happening at the front, there was a bit of fog of war back at headquarters. Nivelle and his staff were forced to just wait for information to begin to trickle back. During this time the atmosphere at headquarters was very subdued and nervous. There was not solid information a high command until around 10:30 when the first official report arrived. This report had been preceded by rumors and scattered information that the attack was not going as well as had been hoped. What became obvious with the first report, and then others that would follow, was discouraging and exactly what Nivelle had hoped and had believed would not happen. As wave after wave of French troops were sent forward, with the objective being to exploit the gains made by the previous waves, they were instead being sucked into attempts to take the first set of German positions. This instantly began to throw off the entire time table and it resulted in an attack that was not a bold thrust through the German lines but instead an attack that devolved quickly into what previous attacks had been line, just a mass of men struggling to make any forward progress while suffering heavy casualties. What happened at the frotn for the rest of the day did not make the situation better. The day ended with no French soldiers having gained more than a few kilometers of ground, an impressive failure even by Western Front standards. And for these gains the French had paid a high price. Some regimental and battalion level units pretty much ceased to exist, with some divisions like the 2nd Division of the 5th army suffering 3,700 casualties. To make matters worse, the French had not properly planned for the number of wounded that they were now experiencing. They had after all planned for a great success, and the number of field hospitals and medical facilities that were available was woefully inadequate. A parliamentary deputy serving at the front would describe why this was the case "Why? Like everything else, it was because in this offensive we’d planned for everything but defeat. We began from the idea that the offensive would be a success. That’s why nothing had been organised: no evacuation routes, too few aid posts, impossible to get the field ambulances to the wounded." Back at Nivelle's headquarters even his extreme optimism could only do so much to dress up the reports that were coming in at the end of the first day. Remember, he had promised great successes within 48 hours, and things were not looking good halfway through that time limit, so he did the only thing he could, he planned to continue the attack. It was believed that the German defenses were weaker across from the 5th Army, or at the very least it had done better on the first day, and so that would be the area that would get the most support. Nivelle hoped that he could contain news of how the attack was going, but in this he was unsuccessful. By the next day information had already made its way back to Paris, and to Haig who would write "Nothing seems to have been gained. Reports were at first very favourable. Later it was said ‘Enemy counterattacked very strongly and ground gained was lost’. French claim 10,000 prisoners but the attitude of French officers attached to my staff makes me think that they are not quite satisfied and that the much-talked-of victory has not been gained by the French up to date." Nivelle would try to maintain a shroud of secrecy as long as possible, and even on April 17th Haig would still be somewhat in the dark as to exactly what was happening "I could get no details from the French as to the results of today’s fighting, which is always a bad sign and I fear that things are going badly with their offensive." For the moment, the first day of the attack was over, and it had been a failure, but soon the French would try again. I hope you will join me next week as the Nivelle Offensive continues, and then ends.